One of my friend’s teen daughters is really good at giving pedicures. Last weekend while hanging out at their house, she offered to do our feet. Of course, that isn’t something we weren’t going to pass up on! One of the things she used on our feet was a homemade sugar scrub and it felt lovely. 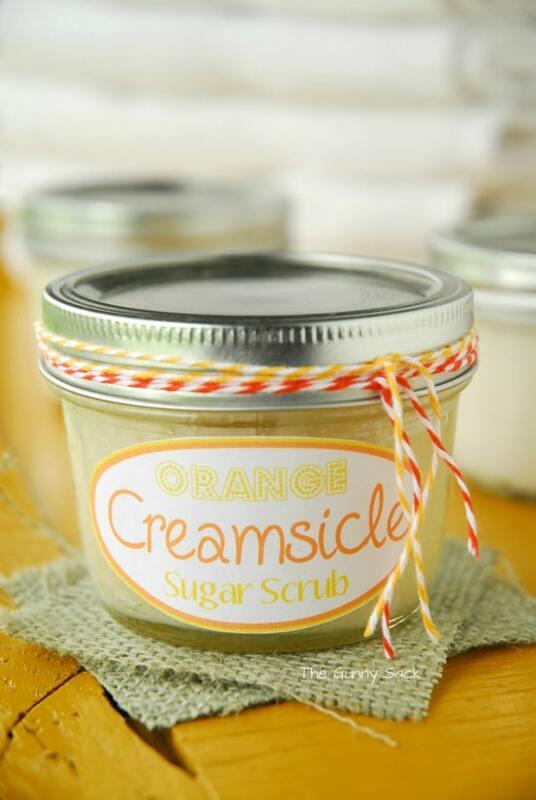 And it motivated me to make new sugar scrub recipe. 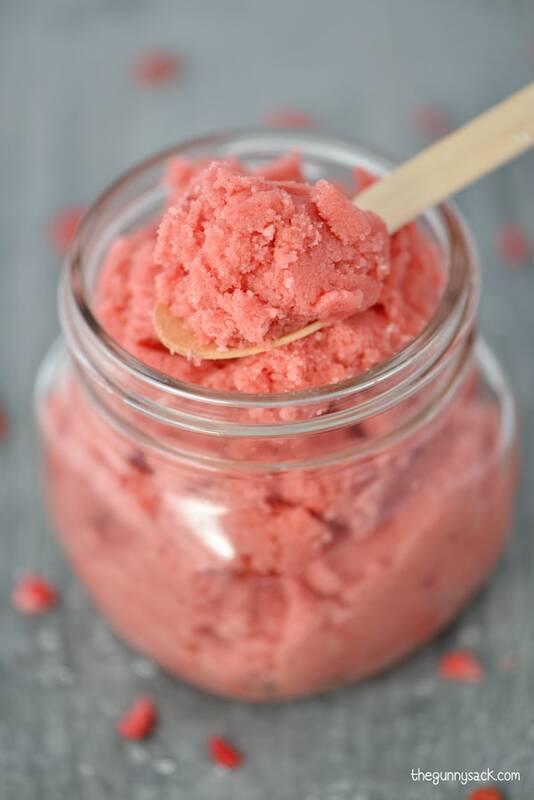 This Strawberry Sugar Scrub is perfect for putting into mason jars and giving as gifts! Start by whipping the coconut oil. 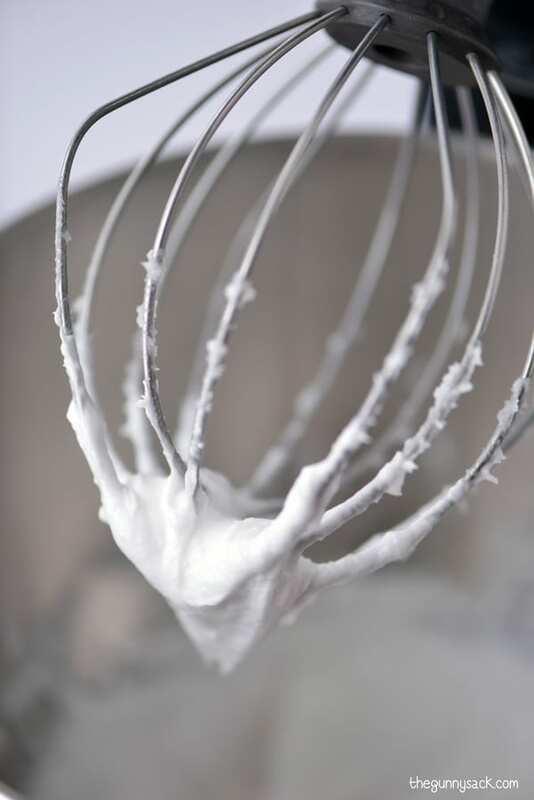 I used my stand mixer with the whisk attachment and whipped it for about 5 minutes. Add the sweet almond oil and mix. Next, you need some strawberries. 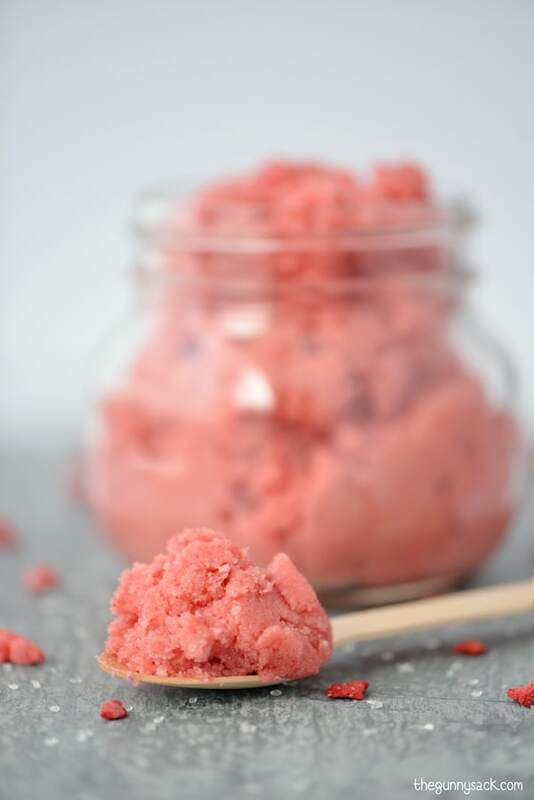 I wanted this sugar scrub to last longer than a couple of days, so rather than use fresh strawberries, I used freeze dried strawberries. I put them into my clean, dry coffee grinder. 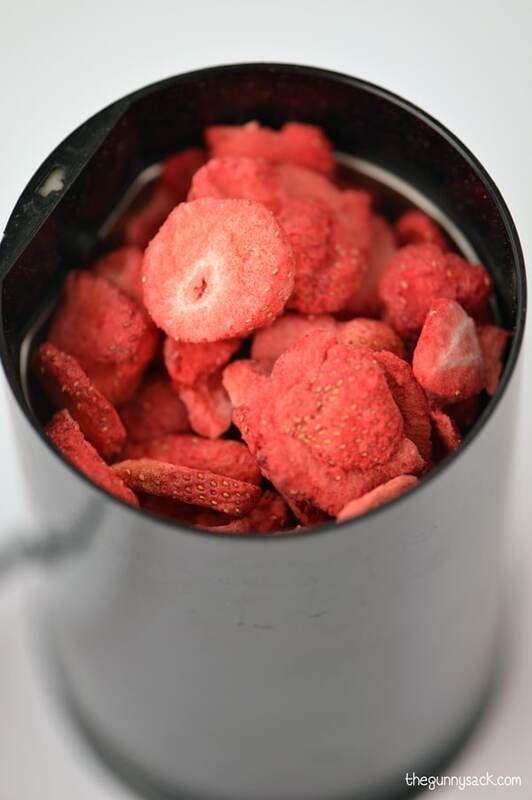 Grind the freeze dried strawberries until they are powdery. 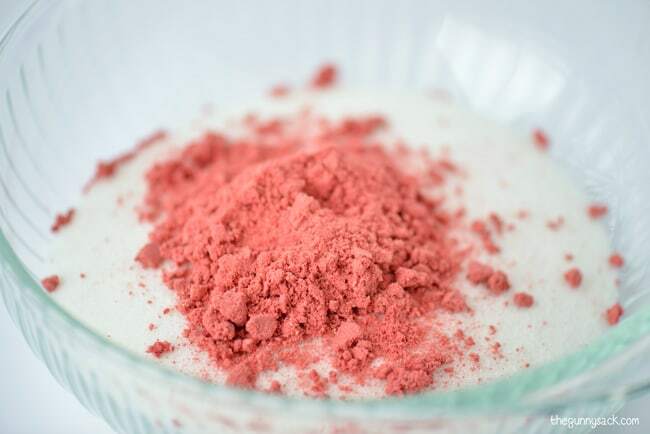 Mix the powdered strawberries with the granulated sugar. I started mixing them with a whisk and then sifted them together. Gently stir half of the sugar mixture into the coconut oil/almond oil mixture. Then, stir in the second half. Optional step: The sugar scrub is ready to use right now, but I added some strawberry extract to mine to enhance the strawberry scent. The coconut oil I used for this sugar scrub has a strong coconut scent compared to coconut oils I’ve used in the past. The scent overwhelmed the strawberry scent. So, I added 4 teaspoons of strawberry extract, but this is completely optional. Yummmm!! Admit it, you kind of want a taste. Actually, you can taste it, or better yet, use some as a lip scrub because all of the ingredients are edible! 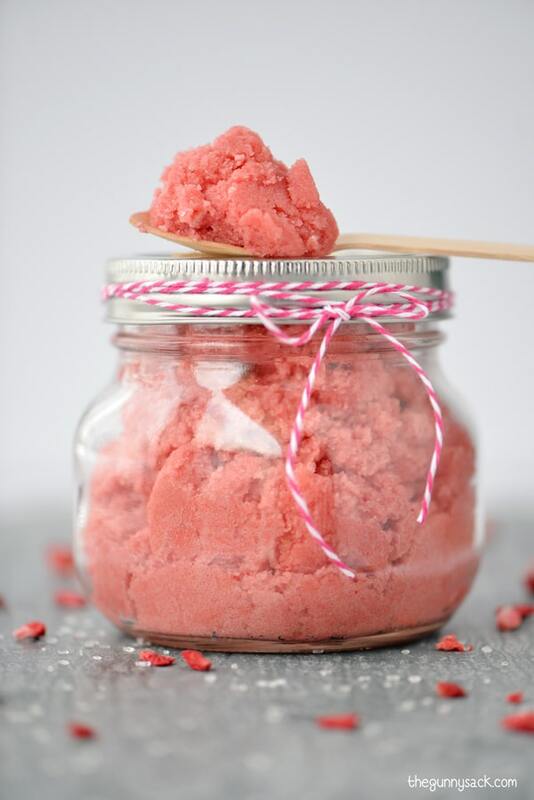 Put the sugar scrub in one large mason jar or a few smaller ones. This recipe makes enough for three 8 oz jars. 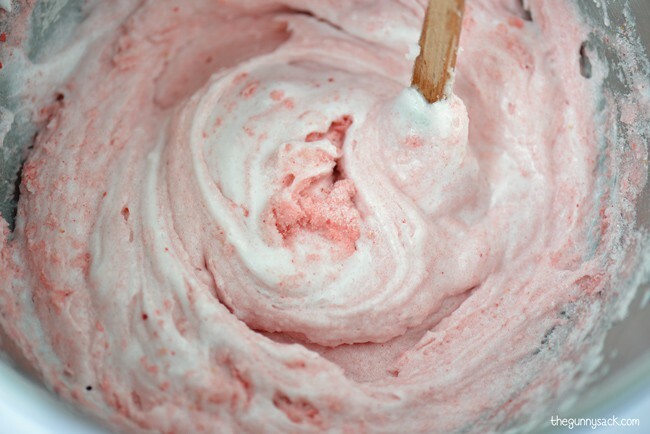 This Strawberry Sugar Scrub recipe will make your skin feel so soft! This would be a wonderful homemade gift to give to the women in your life for any special occasion from Valentine’s Day to Christmas and Mother’s Day to birthdays. 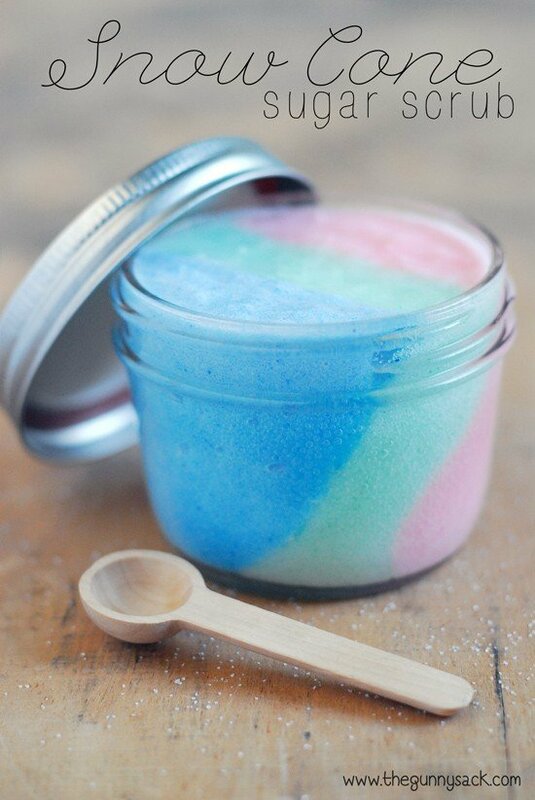 Or, why not have some girlfriends over for a spa night and share this coconut oil sugar scrub with them. 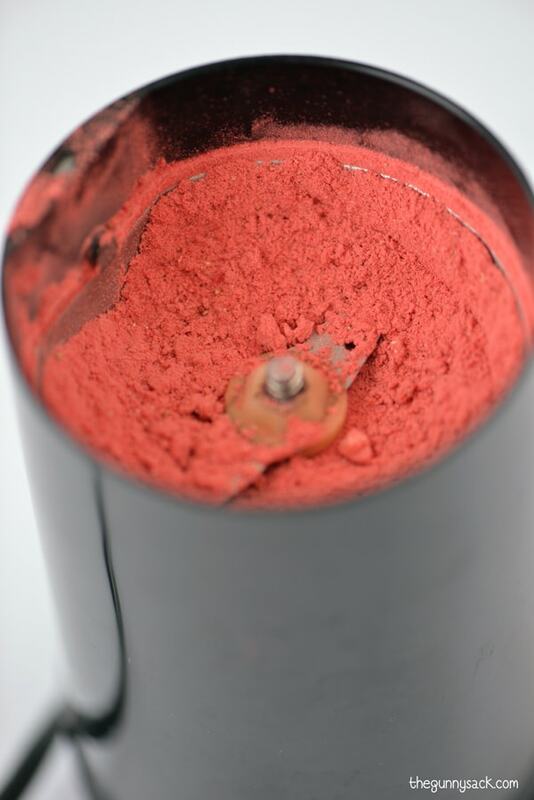 Grind enough freeze dried strawberries until you have about ½ cup of powder. 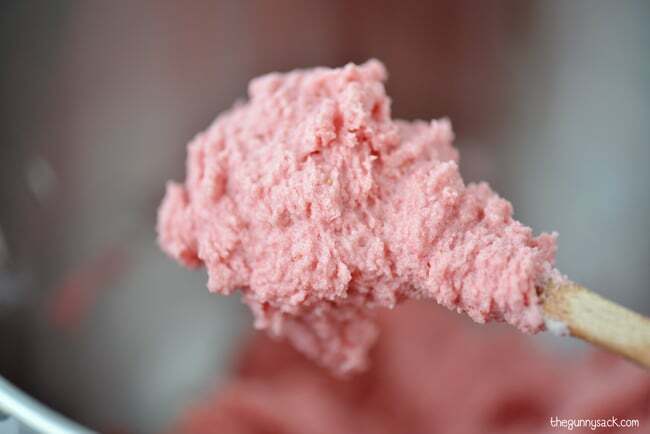 In a separate bowl, Whisk and then sift together the granulated sugar and powdered strawberries. Gently stir half of the sugar mixture into the coconut oil mixture. Then, stir in the second half of the mixture. Optional: mix in strawberry extract. Note: If using in the shower or bathtub, be careful because bath products containing oil can make it slippery. Thanks for the recipe! I would like to try it and give it as a gift to you the ladies in my church community group. One of them, however, may be allergic to coconut, and another one has a husband who is severely allergic to tree nuts. Do you have any suggestions for alternative oils I could use for this sugar scrub? Thanks. 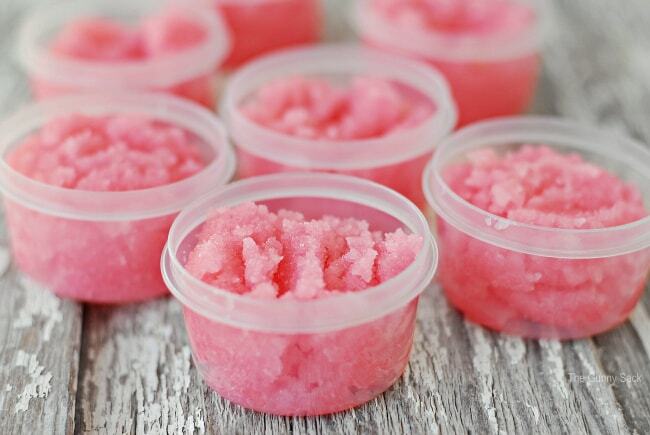 Yes, you can use another oil of your choice to make a sugar scrub. With a severe tree nut allergy, I’m not sure that any of the oils are safe. I’ve read that some olive oils even contain other oils as fillers. I would be extremely cautious. 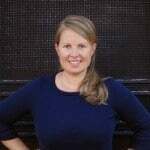 Where do I get freeze dried strawberries? Can you use fractionated Coconut Oils or does it have to be the whipped food grade kind? Sorry, I’ve never tried making it fractionated coconut oils. Very nice!!! 🙂 I bought the ingredients to make this! Just wondering… doesn’t the sugar dissolve after a while? Also.. I only have a stick blender (no mixer). That shouldn’t be a problem right? Since the sugar is in oil and not water, I have not had that issue. I’ve never used a stick blender so I’m not sure how it works with whipping the coconut oil. Best of luck! I was wondering if I could use this scrub for my face? Do I need to substitute granulated sugar for brown sugar in order to use it for my face? Yes, you could use it a face scrub. Brown sugar is softer than granulated sugar, but either one work. Also, I’ve heard that depending on your skin type, coconut oil might clog your pores so make sure you rinse well. Enjoy! VERY nice. I love the effects strawberries have on my skin. About how long does this “keep”? Do you suggest refrigeration? This recipe is adapted from Fig + Yarrow’s Lemon Sugar Scrub Recipe which says the sugar scrub will last for a year at room temperature and longer in the fridge. The addition of the freeze dried strawberries might change the storage times, but it never lasts that long at our house! Enjoy! Love your ideas. I want to try those sugar scrubs.